New York Jets Confidential – NFL Football » Maccagnan/Bowles/Johnson need to learn from this! I would have voted for “The Arrested Players” as well. Personal responsibility is very important, and those accused of breaking the law own their actions, not Bowles, Maccagnan or Johnson. But in my opinion this should be a teachable moment for the Jets’ brass entering a crucial off-season. Of course you should blame the players for their actions. However, if you bring in three guys who’ve had issues in the past, and then they proceed to have issues under your watch, doesn’t the person who acquired them deserve just a little criticism? How about using Adams-Maye-Davis-McCown as your character template for all players acquired moving forward? As for Bowles, perhaps he needs to strengthen his message to the Jets’ players about their behavior, because when you have three arrests in three months, clearly the past messages didn’t have enough teeth. Every time Robby Anderson gets in trouble, Bowles tells us he talked to Robby about what he did. Well clearly those chats aren’t working. Bowles needs to deliver a fire-and-brimstone speech to the players about how Jets are expected to behave off-the- field. The kind of speech that REALLY gets their attention. As for Mr. Johnson, whose one of the nicest guys you will meet, he needs to not be nice for a few minutes, and sternly tell his two top football men these arrests are embarrassing to his organization, and they need to fix this mess. So yes, the players are too blame for their arrests, and that is how I would have voted, but Bowles-Maccagnan-Johnson need to come up with a plan to deal with this troubling trend, before they damage some of the cultural gains their team made last year. 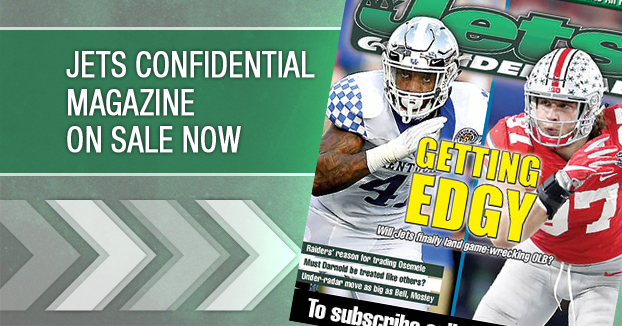 *****The new issue of the monthly Jets Confidential Magazine is out. The most extensive free-agent preview anywhere. You can buy one on a NY-NJ-CT news stand. You can also subscribe by clicking below or by calling 1-800-932-4557 (M-F, 9-5). A must-read for Jets fans.